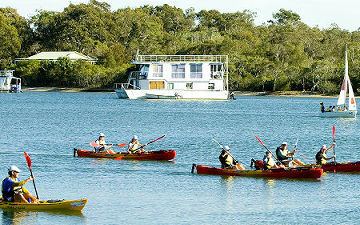 Facing North to the Noosa River, there are no roads to cross to get to the water. 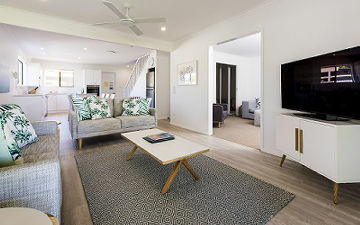 All of these Noosa Holiday Apartments have 1 queen size bed and 2 single beds and one bathroom, with the exception of the 3 bedroom apartments and our 4 bedroom townhouse. (please enquire when booking). At times (during low season ), 1 bedroom apartments are available by closing off the second bedroom. 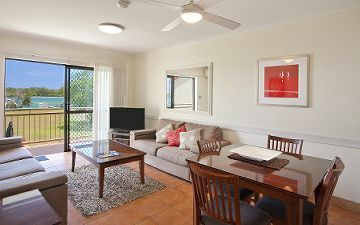 With this Noosa accommodation mix Cayman Quays can accommodate from the single traveller to the large extended family. 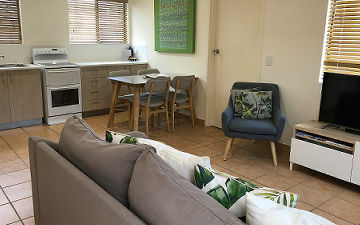 "“Great accommodation” - We stayed in a lovely 2 bed apartment, it has every amenity and was so clean, spotless! Great to have a little playground for the kids and DVDs and magazines to read. The manager was very friendly and helpful. Highly recommend! “Went the extra mile to make sure our stay was great” - We originally only booked for three days and ended up staying for more than three weeks. Staff were helpful and friendly, it was clean and ideally situated on the riverside with its own little beach and boat jetty. It is only a five minute walk to the pirate playground and riverfront area. Would highly recommend. “Quiet and relaxing” - We were a group of 5 ladies and 1 man staying for a badminton tournament at the local leisure centre. We stayed in the townhouse which was perfect for us. 4 bedrooms, 3 bathrooms and 2 lounges. Loved waking up every morning to a great view of the river. Place was clean and well equipped.